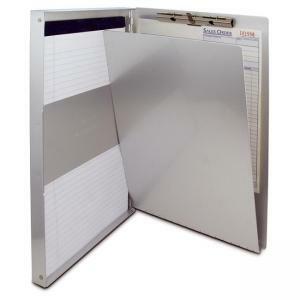 Saunders Aluminum Storage Clipboard - 8.5" x 14"
Side-opening form holder with 3/8" storage compartment features an inside clip that allows easy access to forms. Form holder is treated with antimicrobial agent to reduce the formation of bacteria and fungi. High tension serrated clip securely holds a stack of paper up to 1/2" thick. Hinged writing plate conceals documents and prevents write through on multi-part forms. Storage compartment holds more than 30 forms with a hinged strap inside the cover. Form holder is made of aluminum with 60 percent post-consumer material.